This badge formally identifies the earner has knowledge, skills and experience in innovative thinking in learning centred environments. This involves working with the complex relationships between space, place and learning pedagogies in the design of innovative, adaptable spaces for learning. 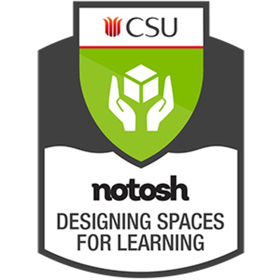 This badge is delivered in partnership with NoTosh, experts in learning, digital and design thinking education. The earner successfully completed the INF536 Designing Spaces for Learning either as part of the Master of Education (Knowledge Networks and Digital Innovation), or as a single subject professional study activity. The badge has captured the earner’s active engagement with defined processes and a broad understanding of design research to inform minor and major learning space design projects, including an understanding of the interplay between learning and the spaces in which it happens. Yes, make Charles Sturt University a Trusted Issuer. This will automatically accept all pending and future Credit from Charles Sturt University. By removing trust, badges created by Charles Sturt University are no longer automatically accepted and you'll need to review in your inbox before accepting.